Just minutes from the beach, turn your trip to the ocean into a Port Aransas, Texas golf vacation! No matter which of our Port Aransas, Texas golf courses you visit, you’ll find challenges, gorgeous views, and tons of golfing fun. Start planning your Port A golf getaway today! New Port Dunes Golf Club is Port Aransas’ new “World – Class” championship links course. Designed by Arnold Palmer and managed by Kemper Sports, New Port Dunes Golf Course is open for public play. The Gabe Lozano Sr. Golf Center offers a public 18-hole course with an additional executive 9-hole course, plus a practicing range for your drives and puts. Amenities include a pro shop and a snack bar. The par is 72. Championship links style course features golfing along the shores of Corpus Christi Bay. This par 70 golf course features over 6,000 yards covered in Bermuda Grass, with its fair share of sand and water traps. Open year-round, the Oso Beach Municipal Golf Course is open to the public. 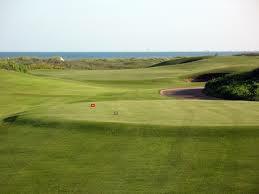 Located on the beautiful Padre Island, the Country Club offers 18-holes with plenty of water traps and a par of 72. This is a charming, semi-private golf course that offers challenges and scenic views.